As we celebrate the AT&T Byron Nelson’s 50th anniversary, 2018 will also mark the tournament’s inaugural year at its new home, Trinity Forest Golf Club. So what’s the new course like? Bill Coore and 1983 AT&T Byron Nelson champion Ben Crenshaw — Coore and Crenshaw, Inc. — are the architects behind Trinity Forest Golf Club’s design. Taking inspiration from many of the great courses of Great Britain, this is a links style course, designed for lots of bump-and-run shots. The structure of the course combines strategic golf with beautiful artistry, and features dramatic green complexes and bunkering and tall native grasses on a rolling meadow. The standout feature that is sure to spark some discussion among the players is the, roughly, 36,000 square foot double green, shared by the 3rd and 11th holes. Come tournament time, the links style design should also be one of the more attractive features for fans. Along with the ability to view multiple holes at once, spectators will also be able to easily maneuver throughout the course, as well as quickly reach different attractions around the tournament. 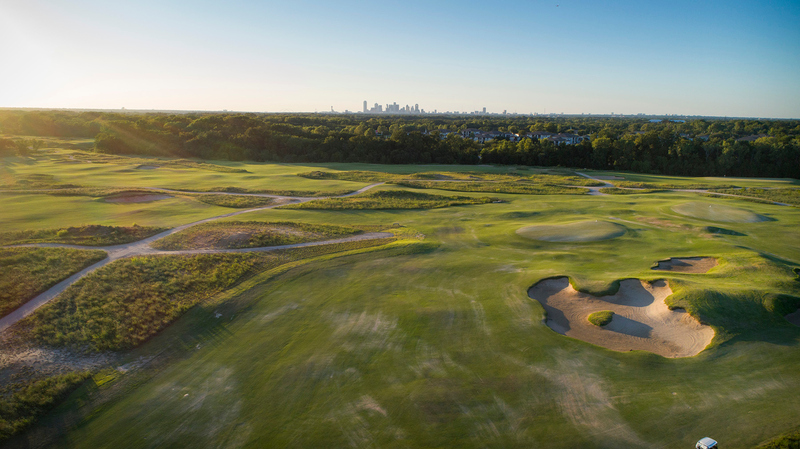 Trinity Forest Golf Club was designed to bring elite championship golf back to the city of Dallas, and we are excited to be celebrating our tournament’s 50th anniversary and look forward to building upon that momentum as we strive for even better things in the next 50 years.